The years following the Chernobyl nuclear disaster saw a rapid rise in the incidence of thyroid cancer among children. The Fukushima Prefectural Health Survey has also resulted in many children being diagnosed with thyroid cancer and undergoing surgery. There are reports of serious cases, such as spread to the lymph nodes, distant metastasis, and recurrence. Even outside Fukushima Prefecture, voluntary health examinations under the auspices of local governments or private organizations have yielded reports of pediatric thyroid cancer. The government holds the view that the accident at Tokyo Electric’s Fukushima Daiichi Nuclear Power Plant has not resulted in harmful health effects and has failed to adopt a comprehensive aid program. Under the circumstances, the children who have been diagnosed with thyroid cancer and their families have been isolated and burdened by the expense of repeated examinations and hospital visits. Every milestone, whether advance to the next stage of schooling, employment, marriage, or childbirth, poses new hurdles. There are also cases of recurrence and metastasis indicating the need for a lifetime of medical care. In order to address such a situation, financial aid for treatment and hospital visits must of course be provided, but a diverse and continuous system of aid is indispensable as well. Moreover, radiation exposure can result in a range of harmful health effects, including thyroid disease. The “3.11 Fund for Children with Thyroid Cancer” is established as an independent, not-for-profit organization providing support for child patients of thyroid cancer and their families as well as investigation into the state of harmful health consequences of the nuclear disaster. * “TENOHIRA” means “Palm”, our support is just like holding children in our palm. From the experiences of the Chernobyl nuclear accident, Fukushima Prefecture has been conducting thyroid examination to those who were under age of 18 years old at the time of the accident since the accident in Fukushima. Over 190 people has been identified as thyroid cancer or the suspected of the cancer in Fukushima so far. It is dozens of times compared to cancer statistics. At the Fund, we have begun to offer benefits for children who have thyroid cancer; the benefits are not limited to medical treatment but can be used for other purposes. 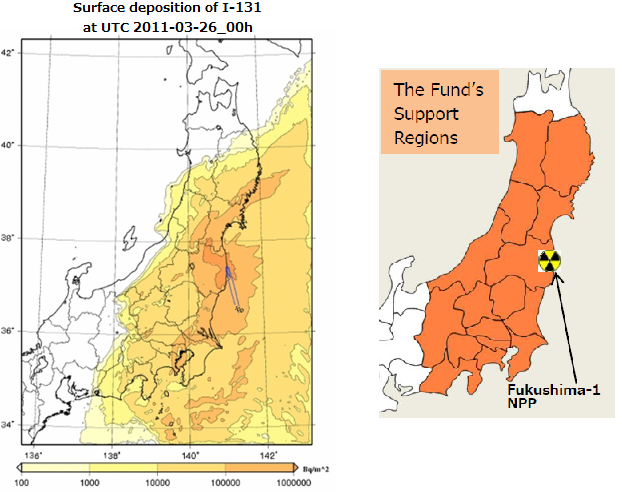 A review committee has been established to determine the payment of the benefits, and the benefits determined until the end of FY2017 is for 81 people in the Fund’s support regions (Fukushima and 15 prefectures). We appreciate your special support and cooperation to those children. Thank you for your kind support to those children with thyroid cancer. Credit Card Payment: please link to secure payment page.